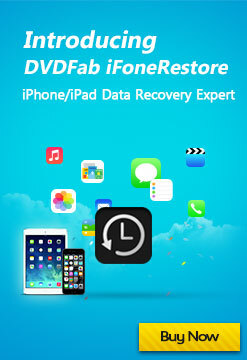 DVDFab - Copy Any DVD to DVDR/PSP/iPod. Fastest DVD Copy Software! 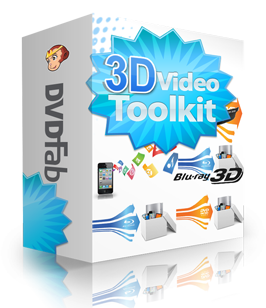 DVDFab 3D Video Toolkit is the universal 3D video converter which can convert 2D DVD, 2D/3D Blu-ray, and 2D video to various 3D videos like side-by-side 3D, anaglyph 3D, etc. It combines Blu-ray Ripper, DVD Ripper, and Video Converter. So this 3D Video Toolkit can also be used to rip DVD/Blu-ray, and convert video. 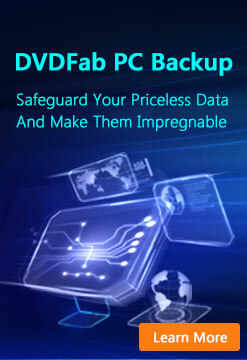 DVDFab 3D Video Toolkit is a 3-in-1 package of DVD Ripper, Blu-ray Ripper, and Video Converter. So, it is not only a powerful 3D video converter, it also has the function of DVD ripper, Blu-ray ripper and 2D video converter. As 3D Video Converter, this package can convert 3D Blu-ray and 2D DVD/Blu-ray/video to all sorts of 3D videos in a variety of formats to meet different needs. As DVD and Blu-ray ripper, users can use this package to rip any DVD and Blu-ray to various video and audio formats for playback on various portable devices, next generation consoles, etc. As video converter, it can convert video between nearly any formats to meet your specific viewing requirements. Blu-ray Ripper is able to rip and convert any 2D & 3D Blu-ray to various 2D & 3D videos, including side-by-side 3D, top/bottom 3D, anaglyph 3D, etc. And the output video can be in AVI, MP4, WMV, MKV, M2TS or TS format. DVDFab 2D to 3D Converter works with DVD Ripper, Blu-ray Ripper and Video Converter to convert normal 2D DVD, Blu-ray, and video to 3D videos, and the outputs also cover side-by-side 3D, top/bottom 3D, anaglyph 3D, glasses-free 3D, etc. And the converted 3D video can be AVI, MP4, MKV, FLV, M2TS, or TS. DVDFab DVD Ripper can rip any DVD to various video/audio formats such as MPEG-4, DivX, Xvid, H.264, AVI, FLV, WMV, MP3, MP4, M4A, WMA, WAV, AC3, DTS, etc. to compatible with iPod, iPhone (iPhone 4), iPad (iPad 2), PSP, ZUNE, NDS, Xbox 360, PS3, Cell Phone, Apple TV, PVP, PDA, etc. It can also rip and convert DVDs into many popular 3D videos including AVI, MP4, MKV, FLV, M2TS, or TS, etc. Blu-ray Ripper can unprotect and rip any 2D to 3D Blu-ray titles to popular 2D and 3D videos in MKV/MP4/AVI/WMV/M2TS/TS or audio files playable on next generation consoles like PS3 and Xbox 360, HD player like WD TV Live, or mobile devices like iPod/iPhone (iPhone 6 Plus)/iPad (iPad 2), etc. Video Converter converts video files on your PC to almost all popular 2D and 3D video formats such as MPEG-4, DivX, Xvid, H.264, AVI, MKV, FLV, WMV, DPG, 3GP, etc. compatible with iPod, iPhone, iPad (iPad 4), PSP, ZUNE, NDS, Xbox 360, PS3, and other specific format supported by Cell Phone, Apple TV, PVP and PDA. It can also convert video to all audio formats such as MP3, MP4, M4A, WMA, WAV, AC3 and DTS, or extract DVD audio from video. Most tools in 3D Video Toolkit are supported by high tech such as NVIDA CUDA, AMD APP, and Intel Quick Sync to greatly accelerate processing speed. Besides, all software contained in this toolkit all support batch conversion and multi-core CPUs. Superior speed can always be ensured to every user.